Blogg-Buzz is a cool service for bloggers like you and me who would like to know the latest buzz that’s happening in the blogosphere. Blogg-Buzz at present operates in a similar way to the popular social networking site Digg. The main difference that sets apart Blogg-Buzz is that here you can submit content only from blogs. If you are a blogger then you would definitely know the pain of getting your blog post to the Digg front page as many members of Digg community hate blog posts and usually term them as “Blog Spam” even though your blog post may be original and Digg worthy. So to address these needs of all bloggers, myself and John hit upon the idea of launching Blogg-Buzz. How do you get benefited by being a part of Blogg-Buzz? 1. You will get traffic from Blogg-Buzz. 2. Many bloggers are going to be a part of Blogg-Buzz so you can get to interact with them via private messages. 3. You will get new readers for your blog. 4. Your blog post need not compete against big news sites to get to the front page of Blogg-Buzz and that is one of the greatest advantage that Blogg-Buzz has to offer you. So what are you thinking? You can sign up for Blogg-Buzz right away here. Blogg-Buzz currently is in alpha stage so there may be bugs which I request you people to report that to us using the contact us form. People now start buzzing and let the game begin. A special thanks to bloggers Carol, Ashish Mohta and Sreedhar for helping us out in launch of Blogg-Buzz. 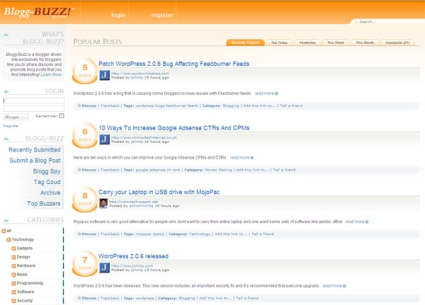 Update: Ashish has written a post on how to go get going with Blogg-Buzz.